This definitively falls on the “monumental” (and maybe even epic) end of the spectrum. 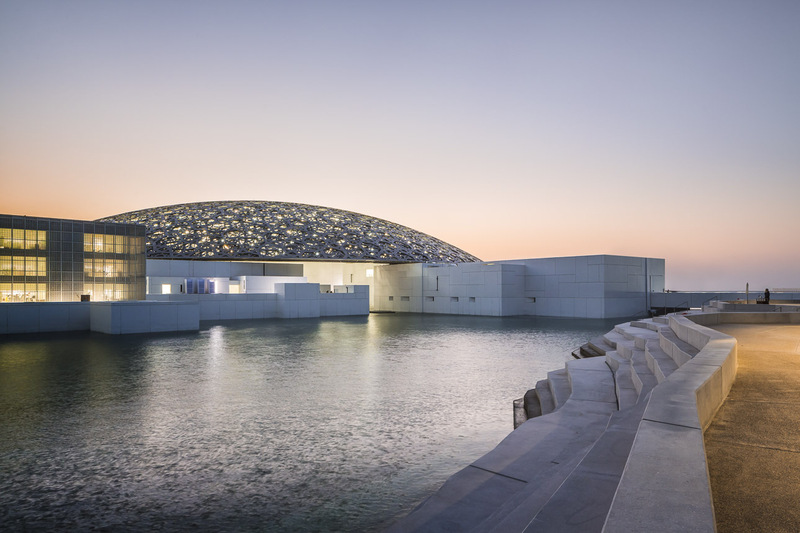 It’s a museum, and not just any museum, but a branch of the Louvre, it’s nearly 10000 m2 in size (100k+ ft2) and it’s in Abu Dhabi, a place not necessarily known for being without money. And it’s an absolute beauty. The grand move here is not hard to miss: it’s a dome, and a big one. But the dome isn’t really what catches your eye right away, at least not exactly. 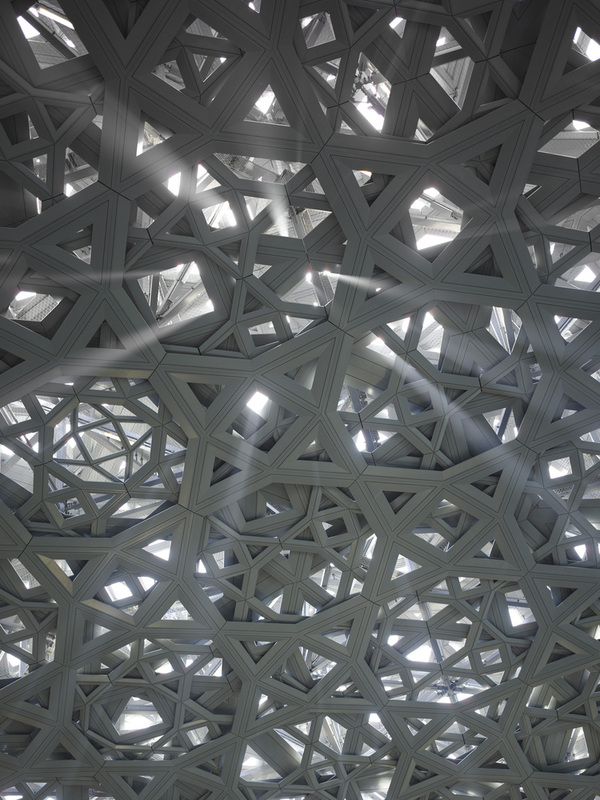 What catches your eye is the nearly 8000 points of light that glitter from underneath, for the dome is not a solid but instead is made up of layers of overlapping geometric shapes to create an irregular pincushion of solids and voids. By day, you get dramatic shafts of light that pierce the plazas below. By night, constellations of upon constellations hover overhead. I could post a hundred photos, and the beauty never ceases to amaze. What’s beneath this dome only enhances this ethereal dance. 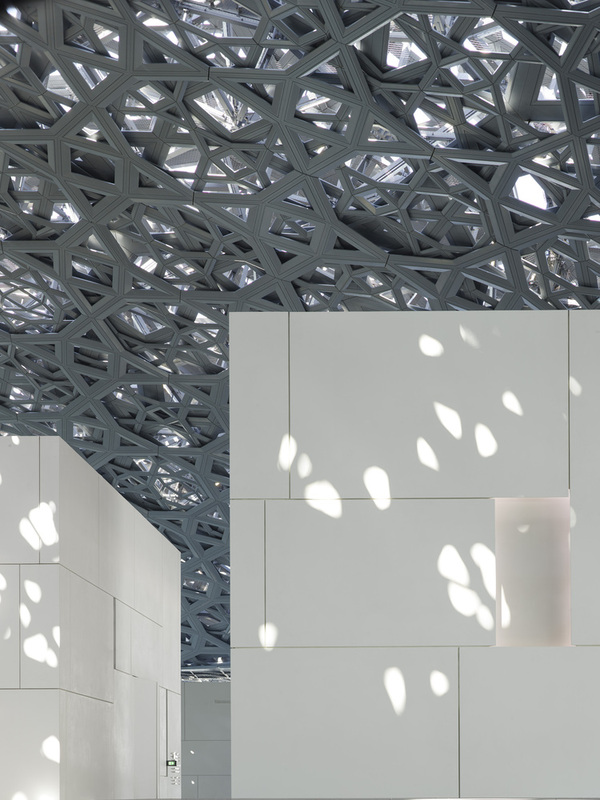 The museum is broken down into (what seems like) hundreds of pavilions, connected by passageways, atriums, plazas, and gardens. You don’t enter a single building and leave at the end of your visit, no, rather you are travelling through a village of irregular buildings, each housing a part of the collection. Pavilions, by the way, that do not touch nor support the dome; by careful construction, the dome seems to hover magically overhead. And if that weren’t enough (! 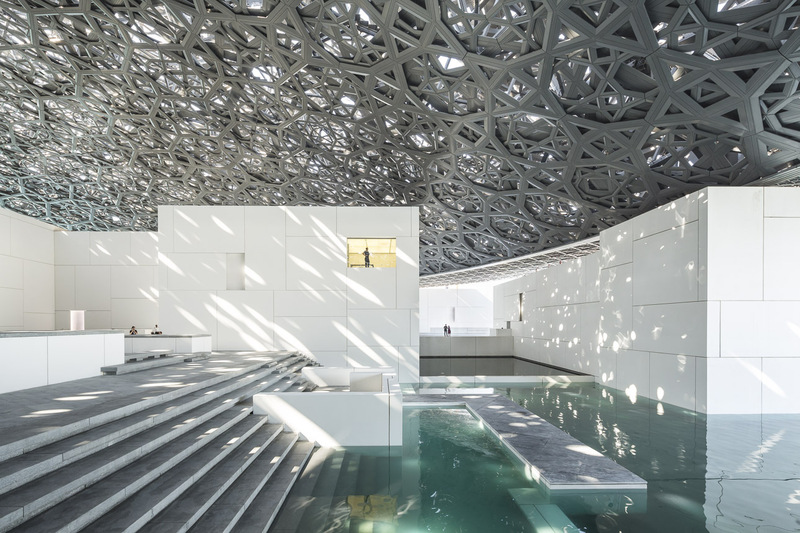 ), the whole thing is built upon the water, such that canals and pools travel into this entire assemblage, providing oases where the flickering reflections from the water match the shifting pinpricks of light overhead as you move through the space. Simply stunning. I cannot help but love this thing. 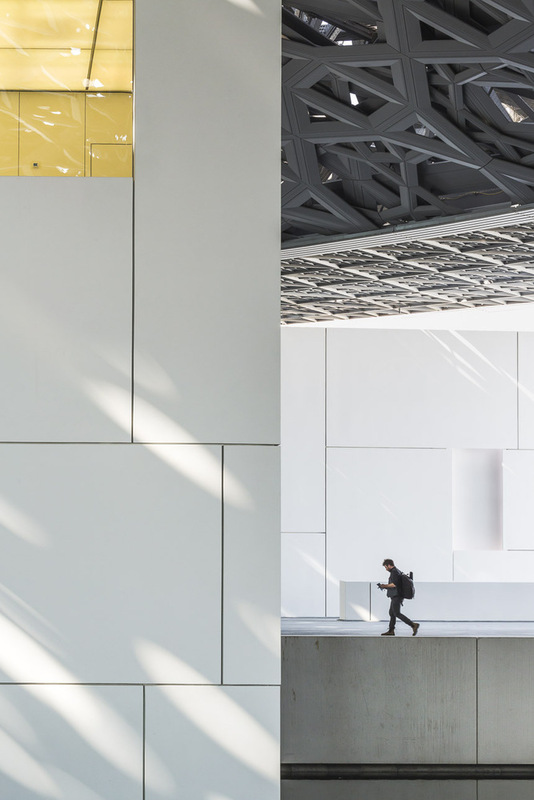 Like the amazing works of Ando at Naoshima Island, here the architecture is as much a part of the experience – and the art – as the works within. 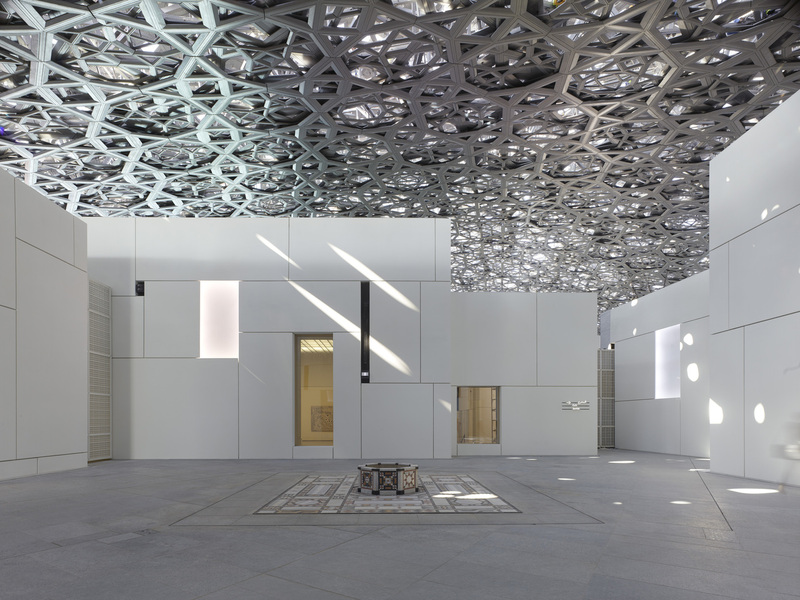 The finely crafted volumes, both solid and void, layered and complex as they recede into the distance, are a joy to experience, and the clusters of irregular buildings creates natural divisions of art and exhibitions that allow for exploration and discovery. Stunning work. 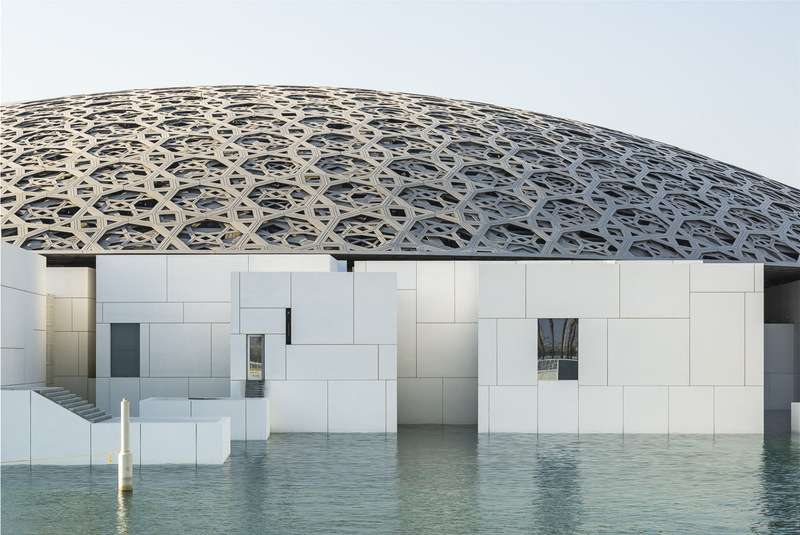 The Louvre Abu Dhabi by Ateliers Jean Nouvel.